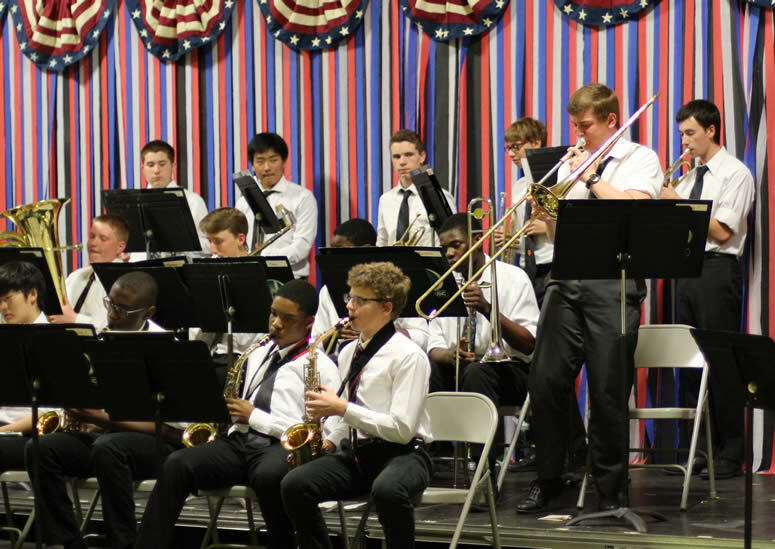 The Mount Michael Choir and Band recently presented "Sounds of Spring" to the Mount Michael Community. Download a compressed mp3 music file via your Sycamore account in the News Section. The choir sang Rest Not!, Music's Echo and Stand by Me. Tenors: Cole McNally, Joshua Snyder, Nicholas Snyder, Blake Worsham. Basses: Jack Blaser, Skyler Davis, Jean-Marie Djidjoho, Kyeongmin Kim, Trenton Sedlacek, and Jimmy Severa. The Band played Blues in Hoss' Flat featuring trumpet soloist Jacob Gathje '20 on trumpet, Imagine, and It's Only a Paper Moon featuring soloists Trevin Detwiler '19 on trombone and Dylan Herrmann '17 on trumpet. Armel Mignondje-alto, Addison Cousin-Hardrick-alto, Cole McNally-alto, Levi Kicken-tenor, Broden Kaps-Tenor, Andrew Ahn-baritone, Ian Kim-flute. Trevin Detwiler-trombone, Daniel Davies-trombone, Joshua Davies-trombone, Trenton Sedlacek-trombone, Joseph Niemerg-tuba. Dylan Herrmann, Chad Duerfeldt, Jacob Gathje, Chaemin Lee, Donovan Kaelin.